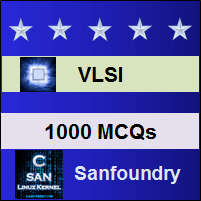 This set of VLSI Multiple Choice Questions & Answers (MCQs) focuses on “MOS Circuit Scaling – 1”. Explanation: All the mentioned are the basic figures of merit for MOS devices. Explanation: The third model is known as combined voltage and dimensions model proposed by Bergmann in 1991. Explanation: In Constant field model the scaling factor of gate delay is 1/α.